Many game designers, prototypers, or print-and-play makers want to present their games in more than just a generic box. I went through a lot of learning when making boxes for my upcoming game Lunarchitects, and I thought it would be worthwhile to share my knowledge and design to the community. At a factory level, most telescoping boxes are made in about the same way. The factory punches out a "core" for the top (outer) and bottom (inner) pieces of the box out of a thick chipboard, that generally looks like a very simple flattened box. Then they fold the "arms" up to make an open-topped box shape. The two top and bottom pieces are slightly different sizes, so they "telescope" together in the expected way. Usually corners are taped to add some structure, but as you'll see in the next step this isn't totally necessary. I'll call these folded chipboard pieces "cores". After the cores are ready, a large sticker is printed that looks like a more-complicated version of the flattened cores: it includes wrap-over locations to secure edges. This will be stuck onto the cores, strategically wrapped over exposed core edges, and will provide a full-printed graphic as well as some structure to the core. At this point, the box pieces are basically done. Unfortunately, many of the pieces that are made in factories are too big for most people to make at home, so we'll make most of the parts in pieces and assemble. The first thing you have to think about when designing a professional-looking telescoping game box is the overall size. In my exploration for Lunarchitects, I found a box size that fits all my components and has a decent presence on shelf. For more of my thoughts see my other blog post, Box Size Choices, and their Impacts. If you're designing a game for production, I love this blog post from League of Gamemakers on the apparent relationship between MSRP, box size, and component count. The second thing you have to decide is the thickness of the stock. Generally stock of materials for higher-value (hobby) game boxes is between 1.5mm to 2.0mm. This provides nice stiff box sides without adding too much weight. I went with a 1.5mm-thick stock with a sticker-wrap for Lunarchitects. Sometimes this thickness will be influenced by the availability of chipboard material, so make sure you know you can get what you're designing for! After you know your box sizes and material thickness, you can get into the nitty-gritty of designing the parts you'll assemble into the boxes themselves. I planned everything out digitally (Illustrator), but it's just as easy to draw it all up on a large paper or scale it down. Each of our cores will be built from five pieces: One Face, two Long Arms, and two Short Arms. These are pretty much the easiest parts to design: the TOP (outer) FACE is cut to exactly the same size as the final overall dimension of the box. In my case, I went with a 300 x 223 x 70 mm box, so the TOP FACE was 300x223mm. The BOTTOM FACE is a tiny bit trickier, because it has to fit inside the top face. And the proper sliding fit depends on the thickness of the core chosen! Panda Manufacturing suggests that for a 1.5mm-thick stock, you should take 3mm off each side - which means in my case the bottom face was sized to 294 x 217 mm. That seemed to work out nicely. If you think about assembling the core pieces together, you know that both arms can't be the same length as the box sides, because they'd be in each other's space at the corners. So one set of arms has to be a bit shorter than the full length. In Lunarchitects's case, I used the longer arms as the full-length arms. So my TOP LONG ARMS were designed at 300 x 68. Similarly, my BOTTOM LONG ARMS were designed at 294 x 65 - the slightly shorter "heights" were there because you don't want it sticking out too much, and the top of the BOTTOM ARMS rest against the inside of the TOP FACE, so if it wasn't shorter it'd stick out and make the box taller than 68 mm. The SHORT ARMS are basically the same as the long arms, but due to the aforementioned assembly interference, they are (material thickness x2) shorter. So for me, I designed 220 x 68 (TOP SHORT ARMS) and 214 x 65 (BOTTOM SHORT ARMS). The first time you make these boxes, you will probably find out how critical accurate measurements are to the final fit of the box. I used calipers (I'm an engineer) and a blade / straightedge, as it seemed to give the best results. It's in this assembly step that you'll find out how good your measuring and cutting was. In my experience, I had the best luck assembling all four ARMS together, then attaching the FACE on top. I used basic scotch tape, 2x on each edge of the ARMS, then a bunch of pieces attaching the arms to the FACE. I put everything on pretty tight, to make sure they don't have any flex. Do remember that when you do the intersections of the arms, you have to pay attention to which is the arm you removed material from (for me, the short) and make sure it butts up against the other when you tape. After it's assembled, check the fit to make sure it slides together. There will be a bit of room between, but that gap with be reduced once the sticker wrap is added. Here's where more pre-work is required. You have to design a large sticker that will wrap around all the edges of your core, so only printed material is visible. Since it'll probably be fairly large, it's likely you'll have to tile printed stickers together to get it big enough, but it's important to do that before it is put on the core (for alignment). The intersections of the sharp points just outside the face of the box should correspond to the corners of the FACE. The parts that wrap around the ARMS should be all the same length, but the exact amount of wrap over the edges of the arms is mostly irrelevant. Notice the extra flaps on the SHORT ARM sides in the image above? Those short arms will be assembled first, and the flaps are wrapped across the ARMS corners. This will secure the arms together (even without the tape), give extra structure, and will eventually be covered up by the LONG ARM flaps. Everything visible (even the corners) is printed! Speaking of printing, I'm guessing it's pretty large! I had luck tiling onto different pieces, and assembling the pieces beforehand. The fact that you're printing onto sticker / label paper is helpful, as you can just tear of a bit of the backing to help attach tiles together, while still keeping the majority of it protected. After you have everything ready to assemble (core is taped, wrap is tiled and cut out), the most rewarding step comes next: final assembly of each side! 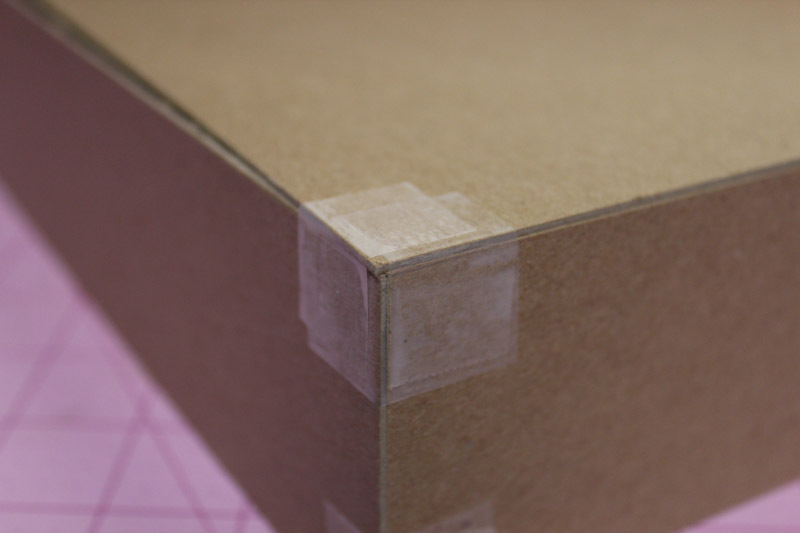 Start by aligning the sticker onto the core it's going onto- I do this by feeling where the corner of the box is relative to those sharp cut-outs on the sticker, and making sure all the spacing is equal. This SHOULD ensure that everything is centered, but I can tell you the first half-dozen pieces I made came out off-center, so it may take some practice. Once this sticker is aligned, it's at this point I like to adhere just the face gently. After that, I remove the sticker backing for the rest of it, and start wrapping up the arms. You start with the sides with the extra flaps (for the corners), and stick TIGHT. It's pretty critical you adhere all the faces consistently. Wrap the flaps across the corners, then wrap the top over the edge of the arms and back down the inside. Finally do the same for the non-flap arms (in my case, the long arms). If you do everything right, the wrap-over length should be the same on all sides (if not, you had a sticker design issue OR an alignment issue). Once you've assembled the stickers on both cores, your box should be done! I hope this instructional post gives you enough courage and instruction to try this yourself! I came at this with very little prior box-making experience (other than being an engineer), so even if you don't think you're crafty, I bet you can have eventual success making high-quality telescoping game boxes.